The exposed brick walls of the building at 109 Saint Asaph belonged first to the Columbia Steam Engine Company in 1871, and carry the weathered look that go with those 128 years, though they now surround the newly-open Columbia Firehouse. The same mix of old and new is the heart of Columbia, the latest venture from the Neighborhood Restaurant Group, who curate a collection of restaurants from Tallula to Evening Star to Rustico, a fine selection of DC’s mid-level restaurants. 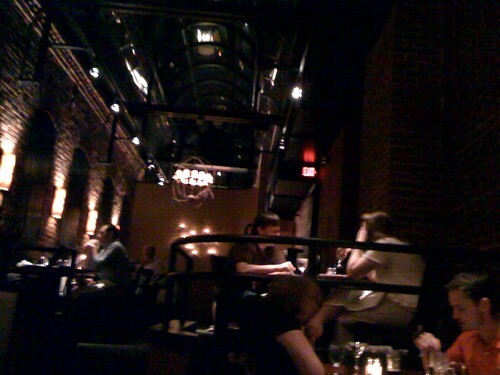 We walked in for a late dinner this past Saturday night into the space I’d been in, for Bookbinder’s, some five years before. The bar was packed with a diverse and lively crowd, where cocktails outnumbered beers, for reasons I would soon find out. We were seated in the main dining room, surprisingly crowded at nearly 10pm, and the first order of business for the stormy night was a long perusal of the menu. Before I started on the main menu, it was time to take a long look at the bar menu. Usually, I’m a beer guy, give me a good local micro brew, and I’m a very happy man. Saturday, when I saw more martini glasses than pint glasses at the bar, I took it as an omen. I ordered a Robert E. Lee Roy, Columbia’s alteration of the classic Rob Roy. Substituting Bourbon for the Scotch, and adding cherry brandy and Southern Comfort with a dash of bitters made for a very fine drink indeed. I was briefly tempted by the Handsome Harry’s Swanky Sparkler, but decided that no matter how delicious macerated strawberries, a slice of lemon and sparkling wine might be, there was no way I could drink it and keep my man card. After the delightful cocktail arrived, we looked at the starters. They ranged from Reuben Egg Rolls to Crab Hush Puppies (of which I’m sure Katie would approve) to the raw bar with locally farmed Oysters. We opted to eschew the oysters (I know some folks love ‘em, but I am not that brave.) for the beautifully formed hush puppies and their tasty sweet pepper mustard sauce. A crispy crust, an crab and corn-meal on the inside, we were deeply pleased with the addition of the mustard sauce. When it came to ordering our entrées, we relied heavily on our server, taking her sage advice to heart before leaping out. I had the Slow Roasted Amish Chicken, which ended up being very similar to Thomas Keller’s very simple take. It’s true, that you can judge a kitchen based on its roast chicken, that a simple dish will stand out solid against the backdrop of the more creative and unique choices from the kitchen. Much like Tiff’s Grilled Pork Chop, the details were the strength of the dish, working in tandem with the sides. The cornbread stuffing, sweet with molasses, set against the smoky andouille sausage and tangy onions was the perfect pairing with the tender and juicy chicken with crunchy and perfect skin. The cheese grits set off the gentle flavor of the chop, providing a sounding board for the locally-butchered pork. But, if you must see in this any advice: Stay For Dessert. While they had run out of the chocolate hazelnut cake by the time the end of our evening had arrived, the woman at the table next to ours looked as if she was having a When Harry Met Sally moment with hers. Our Testudo cheesecake was light and sweet, with a decadent chocolate saucy and a rich caramel. I look forward to a trip back to see if I can’t charm them out of a chocolate hazelnut cake. Our check, with a nice tip, came to just $80, putting it in the range of a solid date-night place. They’ll be doing brunch soon enough, and I can’t wait to get one of the four patio tables that sit behind the wrought iron gate. The rest of Columbia Firehouse is yet to come, with a second floor “intimate chophouse” coming before the end of summer, designed to be a little more upscale, and with fresh meats from Red Apron. Should be worth waiting for.